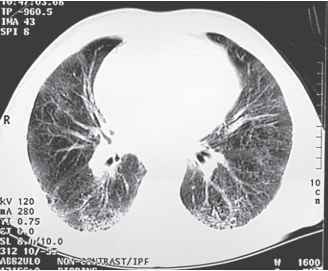 Figure 18-11 Computed tomographic scan of a patient with idiopathic pulmonary fibrosis. of idiopathic pulmonary fibrosis, whereas patients with other ILDs may have a better response (Davies et al., 2003). A meta-analysis of 390 patients with pulmonary fibrosis did find that interferon gamma-1b therapy significantly reduced mortality (Bajwa et al., 2005). Causes of death identified for pulmonary fibrosis in one study included respiratory failure (39%), cardiovascular disease (27%), lung cancer (10%), pulmonary infection or emboli (6%) (Panos, 1990). Unilateral lung transplantation may enhance survival and functioning in patients with advanced interstitial fibrosis with chronic respiratory failure, whereas pulmonary fibro-sis with pulmonary hypertension may require bilateral lung transplantation (Alalawi et al., 2005). One-year survival after lung transplantation is 75%, with 44% of patients surviving 5 years or longer (Trulock, 2001).